Last year GDUSA magazine celebrated its 50th Anniversary. In honor of this milestone I starting digging through our print archives which were filled with great treasures of design history. Among my findings was an article from 1970 about a group of Marines known as Combat Artists who were stationed at the Da Nang Press Center during Vietnam. Last Veteran’s Day, I posted excerpts from this 1970 article on our blog. You can read the original post here. Below is the photo of these 5 Combat Artists and short excerpt from the original article. October 1970: A group of five marines assigned to the Combat Information Bureau decided that they would simulate an advertising series being run by Strathmore in the U.S. They got together outside their shack and posed with a Strathmore sketch pad to show that not only pros and students use it in the U.S., but at the fighting front, it has its use too. Hello there. Just doing some research and came upon your page. I’m the combat artist in the far right of the photo. I’m presently living and painting in Cape Ann, the north shore of Mass. ” Seems like yesterday” when we were there in Viet Nam. I’m still in touch with Ben Long, Gary Moss and Dave Anderson, we all have become successful artists and are very proud of our contributions both as artists and as Marines I shall tell the others about your site. I have to admit that I literally started jumping up and down when I read this comment on the post. I immediately wrote back to Bob Williams and expressed my interest in learning more about the history of the photo and the unique experiences of these Combat Artists. Bob Williams helped arrange a telephone reunion with 4 out of the 5 men in the photo. 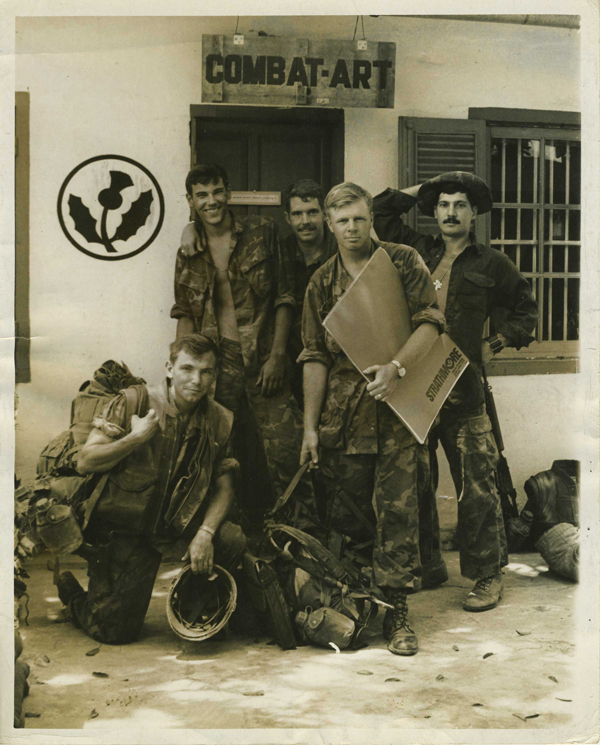 I had the great privilege of being on this call and I also asked Mohawk to join in, since Strathmore, the paper that the Combat Artists used in Vietnam, is one of their papers. The conversation, to say the least, was awe-inspiring. We learned from the men that Combat Artists at that time were selected at Headquarters Marine Corps in Arlington, Virginia, based on submission of a portfolio. 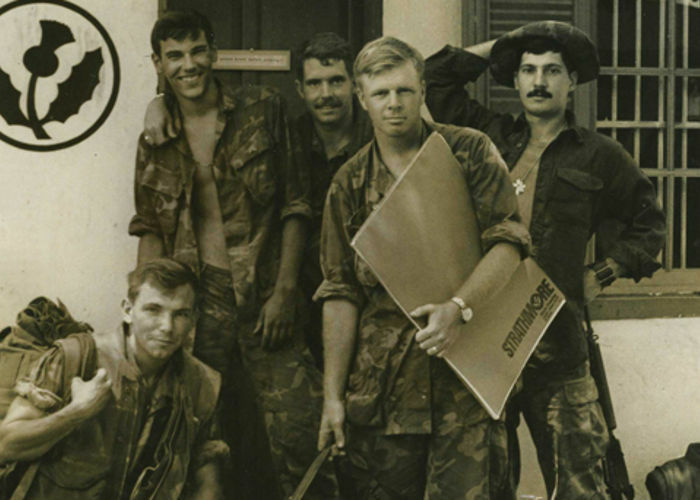 Their station in Da Nang was the central point for collection and dissemination of information for all the major media agencies, such as BBC, AP and UPI. As Marines, they were responsible for the security at the Center but their artwork was expected to be of the highest quality. Each month they shipped their work back to Washington for review and accepted work would then become part of a national traveling show. Combat Art is now housed the National Museum of the Marine Corps in Virginia. 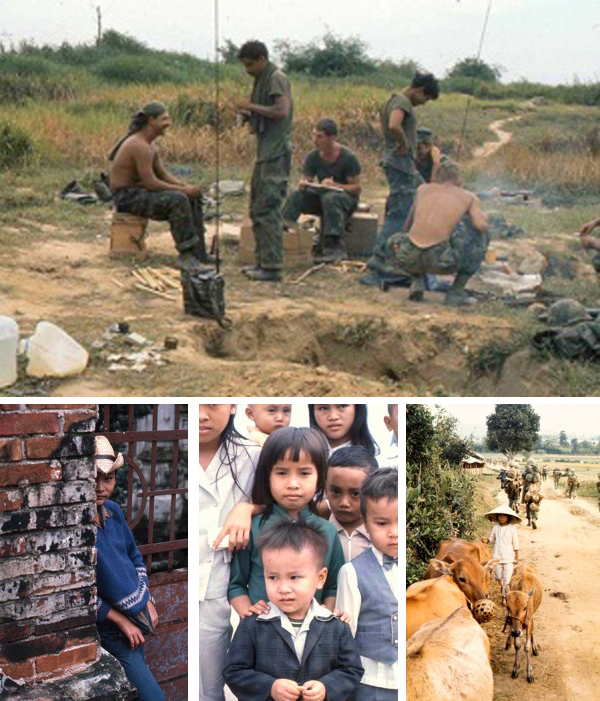 What was so fascinating to me was that while they were Marines, they were encouraged to capture the landscape, the people and a very different side of the Vietnam War then we usually see. They were told, “Go do what you want to do.” Bob Williams’ site has a wonderful page dedicated to Combat Art and also includes a beautiful portfolio of his photos and drawings from Vietnam. As you can see the Combat Artists captured the life of the soldiers but also gave us a unique peek into the lives of the Vietnamese people. All of the men are still working artists and while they are spread out across the country their experiences in Vietnam keep them united over time. One moment that stood out to me during our conversation was when the men recalled their return from Vietnam. They spoke of no hero’s homecoming, but rather a feeling of hostility towards men of service during a tumultuous time in U.S. History. The told stories of wearing men their uniforms on the plane home but quickly changing on arrival to civilian clothes so as to avoid ridicule. Today is Veteran’s Day. I hope that we can honor these men who bravely served our country and who preserved a side of the war we would have never known if not for their amazing artistic ability. I am grateful for having the chance to meet these heros and thank them, and all veterans for their selfless service to preserve our freedom.